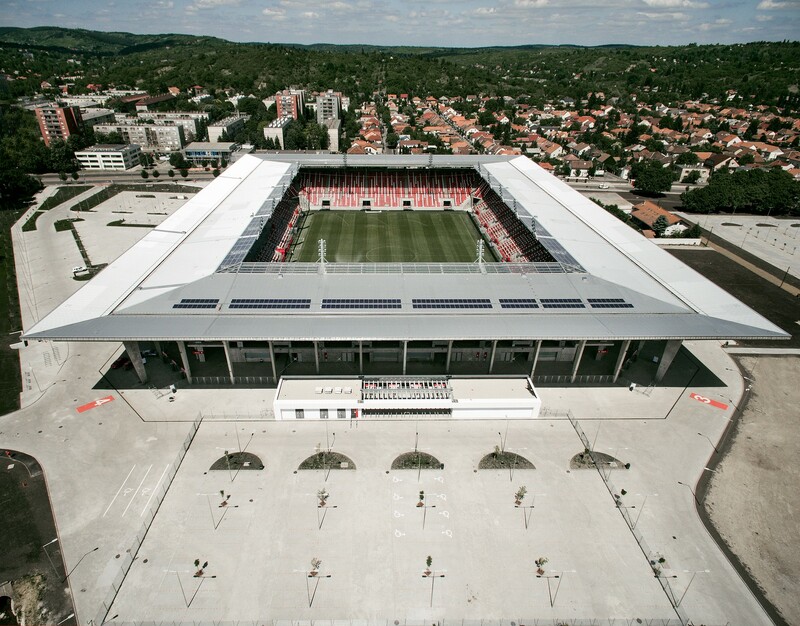 The new football stadium of Miskolc, largest town in Northern Hungary, has been a state funded project. A total of six different concepts were created and presented to the state officials, municipality, sports club DVTK and their supporters. Decision was made that not even the relatively new east stand would be retained, all of the historical stadium from 1939 was razed to the ground. 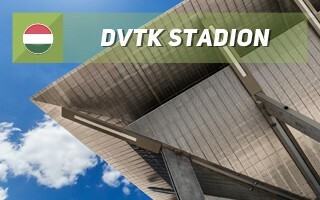 No change of location was considered as this is a spiritual home for DVTK, even if quite distant from the city centre. 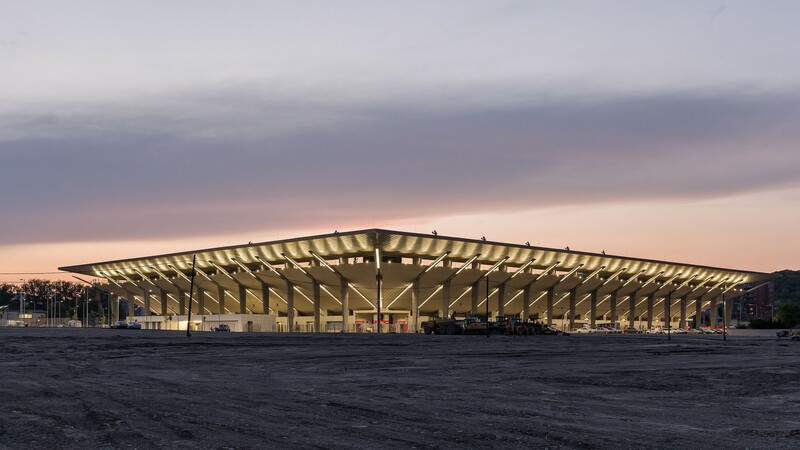 Construction began in November of 2016 and was due to end in early 2018, however the build experienced some delays in delivery. Eventually it was put into use in May of 2018. Its price also changed during the proces, rising from HUF 11 to some 13 billion. Both the time and budget still managed to remain conservative. 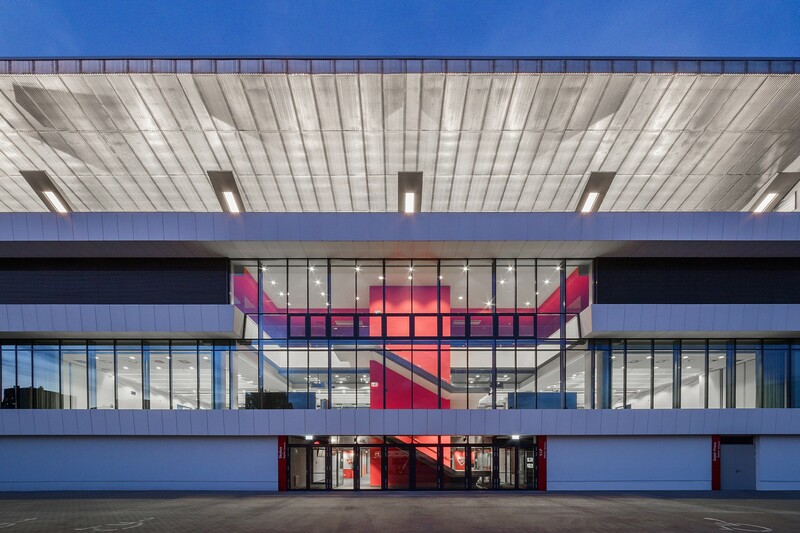 Selected design is characterised by openness and discipline. 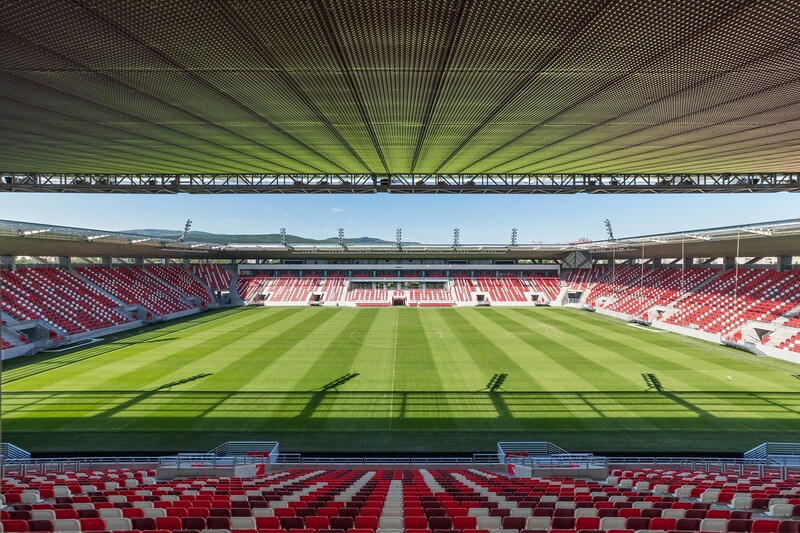 The chalice-shaped mass of the stadium opens up towards its surroundings and attracts the approaching spectators with glimpses of the green grass visible through slits. 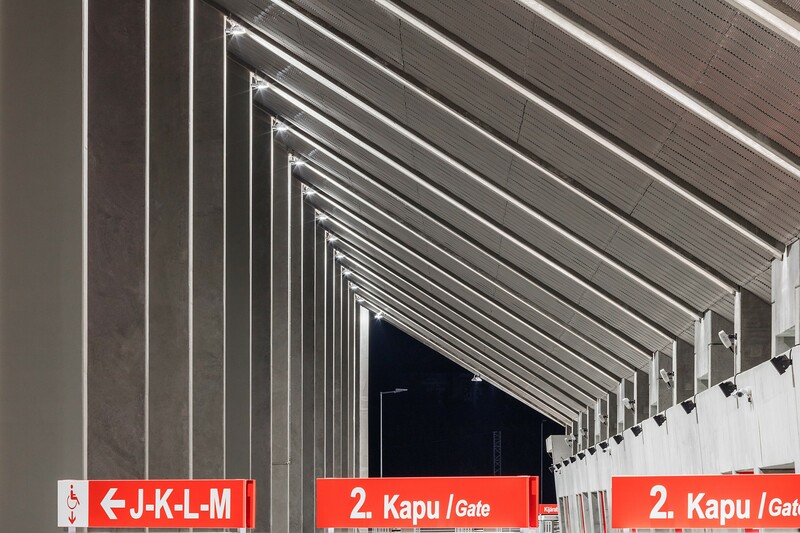 While limited perimeter fencing prevents people from entering on a daily basis, it's placed very close to actual stands, which means even while outside pedestrians are protected from rain or sun by the impressive canopy hanging above. 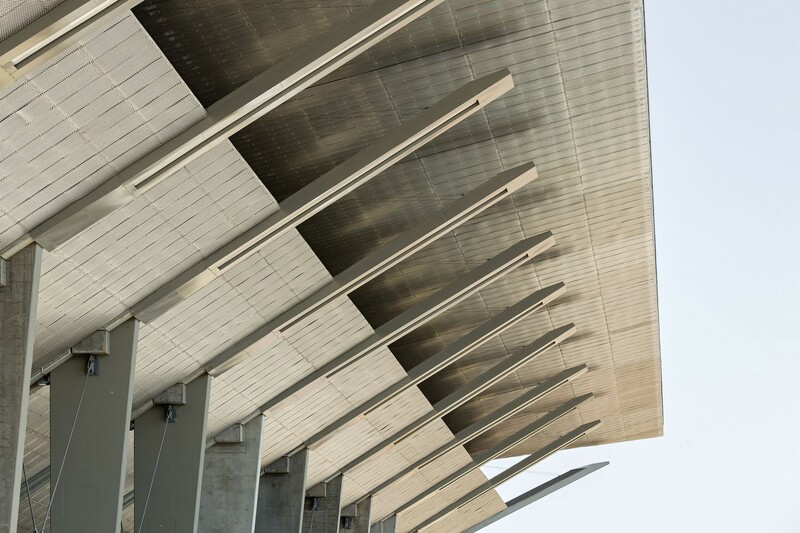 The double mass of the grandstand, supported by slender reinforced concrete pylons, and the pronouncedly overhanging butterfly roof give a rhythmic, floating impression despite their size, owing to the strips of shadow between them. 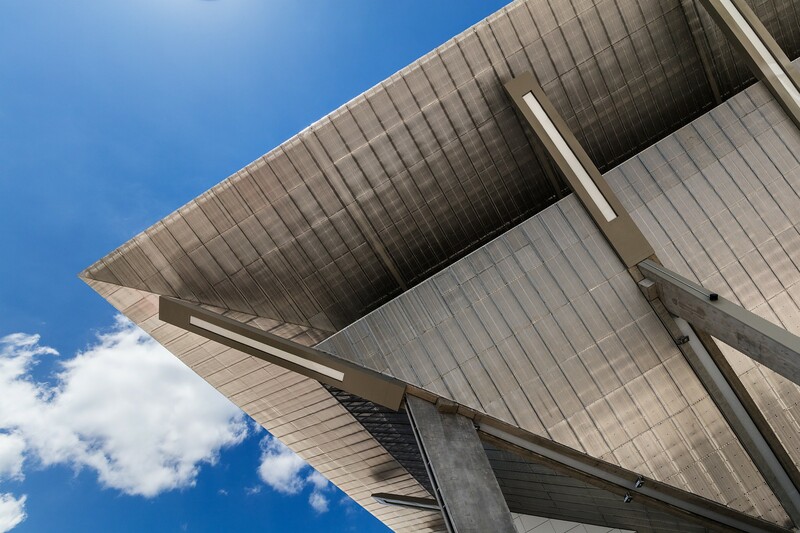 The expanded aluminum plate facing, used everywhere, create simple, geometrical forms of the reinforced concrete and steel structural elements. 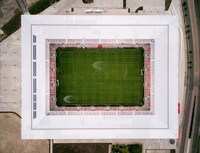 There is a large square in front of the new stadium for 14,680 spectators, divided by stairs and ramps. Main gates are located at the four corners of the building, while 18 entrances lead fans to their designated sections. 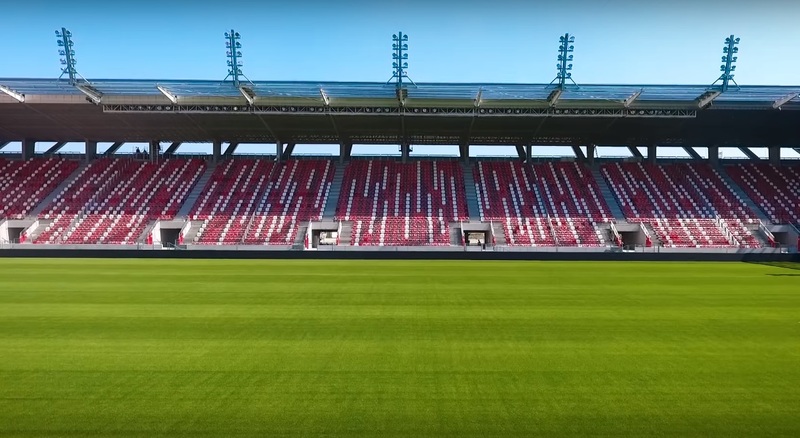 Inside, the uniform seating bowl provides unobstructed view of not just the field but also all other spectators, while the seating pattern is one-of-a-kind, cherishing club colours of DVTK. There are rows of toilets and cafeterias under the grandstand. 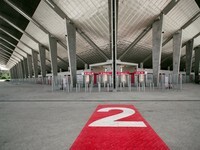 The service building of 7,360 m2 area built around the stadium is divided into three parts according to function. On the northern side, facing the town, is a brasserie open every day and a gift shop. 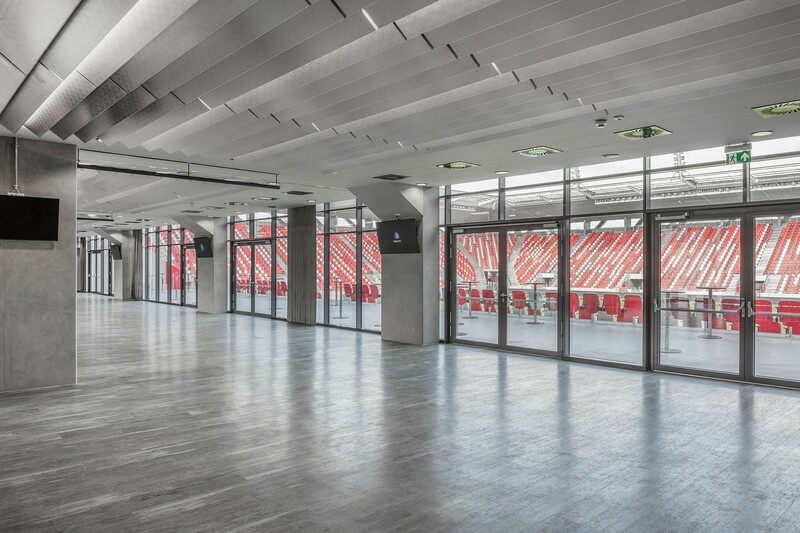 The western side accomodates the changing rooms, event halls (main hall for 500 guests), offices and VIP rooms, including 18 skyboxes. 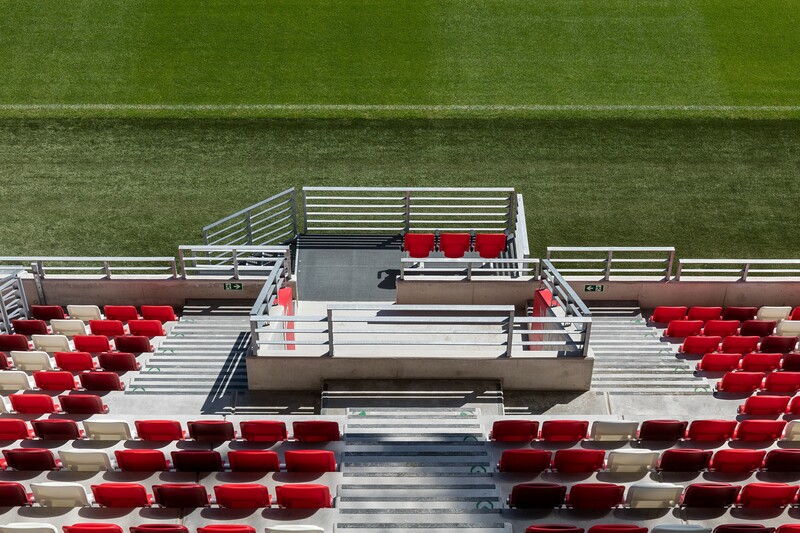 There are building management rooms and areas for the guest fans on the southern side. While there is a tram line running north of the stadium, many supporters still arrive by car. It was thus decided that space would be largely dedicated to public parking areas. 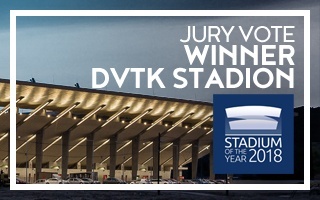 07.03.2019 Stadium of the Year: Jury Award Winner – DVTK Stadion! 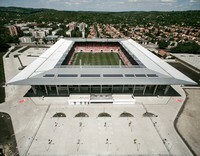 Never in history has a stadium so small won an award in our competition. But if there's one deserving it, it's this one! 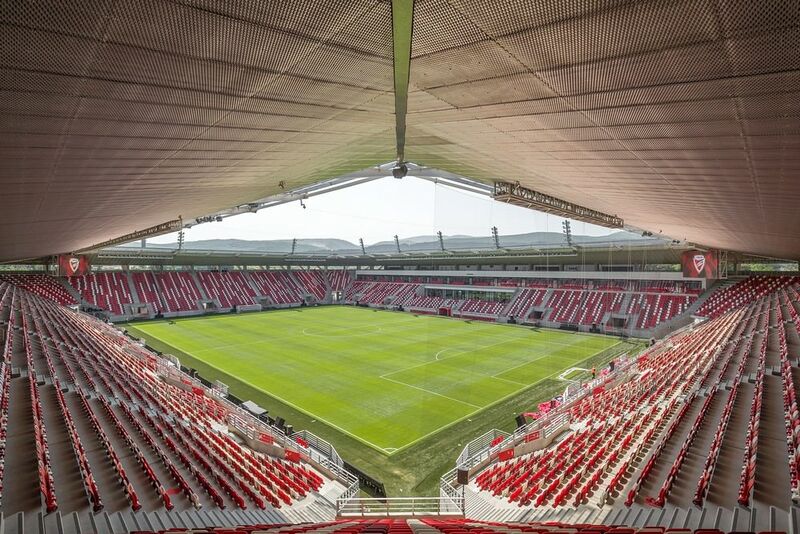 Finally, Hungarian stadium architecture is being noticed for the quality it represents. 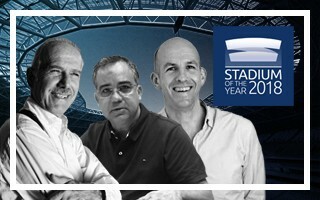 Only the best stadiums are now left in the competition for 2018 Jury Award. 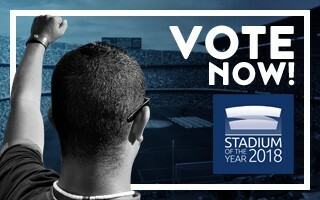 However, you can still support all 27 candidates for the Popular Award. 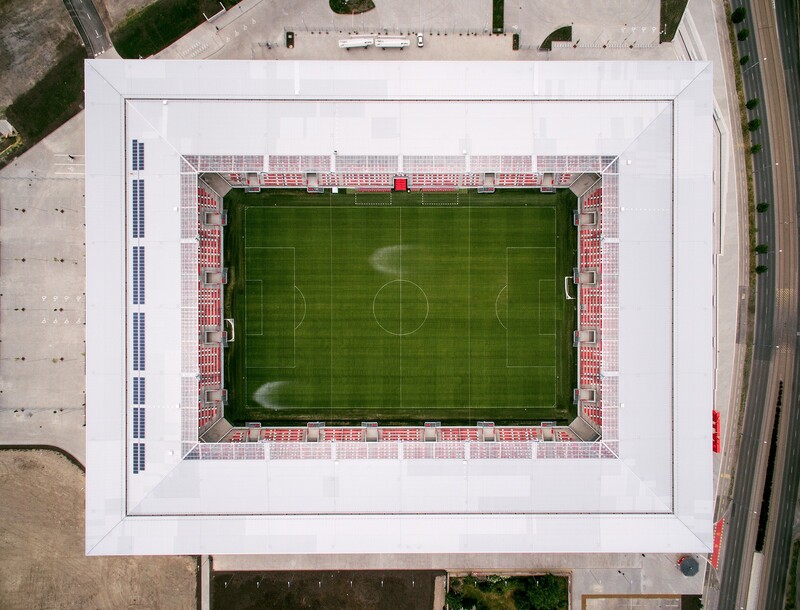 Covered almost entirely with expanded aluminium, this rough combination of concrete and metal shows that medium-sized stadiums don't have to be boring. KÖZTI proved that there's still room for original interpretations, even with limited budget.